Jean Eric-Vergne at the New York City race. Most jobs don’t designate the kind of underwear people have to wear, and those who work from home technically don’t have to wear any. (That’s probably true in offices, too, actually. Who’s going to know?) But two Formula E drivers are $6,000 poorer for wearing the wrong underwear to work over the weekend. Right after winning the Formula E championship title, Jean-Eric Vergne got hit with a penalty for wearing the wrong underwear while qualifying for the season finale in New York City. 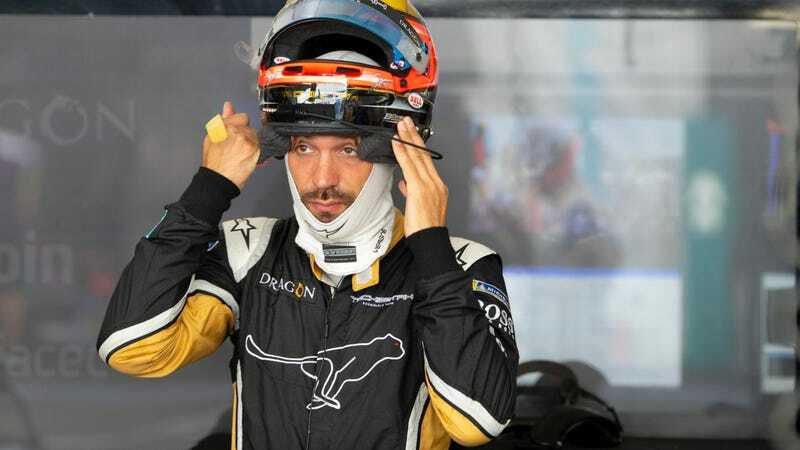 His teammate Andre Lotterer was also involved in the underwear transgressions, landing them both two penalty points against their racing license and $5,900 in fines each at current exchange rates. There are a lot of reasons why these underwear could have been horrible enough for such fines, in terms of normal people and in terms of race car drivers. They could have been the wrong size, the size that squeezes your hips until they get those nice red lines that make you regret the burger and fries last week. They could have been the wrong material, because everyone knows underwear material feels totally different when holding it in your hands in a store than it does when you actually put it on. Or they could have been the cut that always gives you a wedgie, yet you always forget which cut that is and buy it anyway. They could have been the wrong waist height—one of the ones that makes even a nonexistent muffin top bake over. They could have also had a hole in them, but, of course, everybody wears those pairs of underwear just one more time because we don’t feel like buying a replacement. Same deal when the seam starts to separate from everything else. It always works out. They could have been printed with the wrong day of the week, too. Honestly, most people aren’t checking if you’re wearing your Tuesday underwear on a Saturday or not. Racing is the exception. Or, in the case of drivers, they could have been the wrong sponsor—sourced from the wrong sponsor, even. Or, gasp, the driver could have gone commando while having an underwear sponsor. The horror! Nah. Just kidding. These underwear were a safety issue, and that’s it. Formula E’s governing body, the FIA, announced the penalties for both drivers, saying the punishment was for noncompliance. Drivers have to wear fire- and flame-resistant material while racing, but the penalty statement didn’t say what the exact issue was with either driver’s clothing. Former Formula E champion Lucas di Grassi got three penalty points against his license in March for fire-resistant underwear the FIA deemed too short, which Autoweek reported he said he wore because of the heat at a race. The moral of the story here is to wear the right underwear, whether that be for safety reasons in a race car or for the fact that you need to stop being lazy and get rid of that pair with the holes in it. Yes, that one hole is new, actually. Good on you for noticing.